Moving out of a house is a big task, but moving an entire house is an even bigger one. 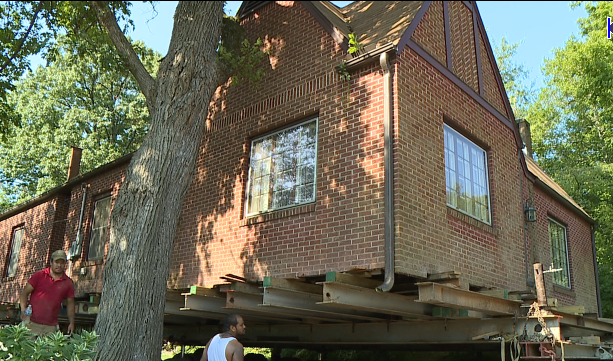 Now you may be asking, why are they moving a house? Well that’s the very mission of the Haywood Heritage Foundation. To preserve and revitalize traditional neighborhoods. “Were moving it for the purpose of preservation, it was no longer needed in the place that it is now, and were preserving it as part of our history,” said chair of membership of the haywood heritage foundation barbara proulx. Thanks to the Haywood Heritage Foundation and donors, this house was saved from being torn down and in turn moved to another location. “And hopefully it encourages them and others to join in and support us, as we continue to preserve the heritage that we have here in our city and county,” said Proulx. As you can see, this is not an easy task, mover Don Toothman says it took a lot of communicating back and forth to move the house. “We doing it all with radio, course we’ve all done it for years, and years and years so if john says go left I go left, if john says jump I jump,” said owner of Toothman structure movers, Don Toothman. The driver says’ it may not be the easiest job but because it’s for a great cause he doesn’t mind it. “Oh I love helping 5013c’s it makes me feel like im giving something back, and it keeps a house from going in to a landfill, it breaks my heart to see a house torn down, and go to a landfill,” said toothman. The house was moved to Oak Hill Drive where it will be prepared to be sold.